“There is no such thing as a bad seat in Martha Cohen Theatre. I am not very tall and worried that if I sat further back in the Orchestra, in Tier One, or in Tier Two, I wouldn’t be able to see what’s happening on stage. I had an assumption that any person sitting in front of me would obstruct my view. I found out that I was totally wrong. I am able to see the whole play no matter where I sit in the theatre. 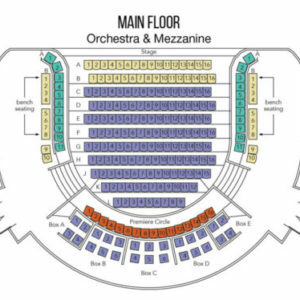 But if I had to choose a favourite, I would choose any middle seat in the centre of the Orchestra, somewhere between rows E and G. These seats are not very close to the stage, nor are they too far back. In these seats, I find I have the best view of the actors on stage, no matter where they perform.” – Manisha, Ticket Sales Coordinator. A panoramic image taken from seat 7 of Row F in the theatre’s orchestra. Lighting/Set design for GLORY by Narda Mccarroll. “I’ve tried a lot of different seats in the theatre. 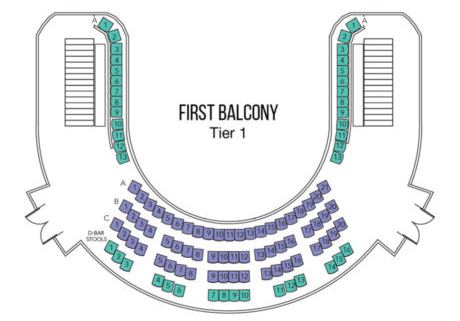 My favourite would be row A in Tier I because it’s an unobstructed bird’s-eye view. I also sometimes prefer to be closer to the stage because it makes me feel more connected with what is happening in the play. Another favourite is seats 5 and 6 of Row D in the Orchestra. It’s just a few seats in off of the aisle and close enough to really get involved with the play.” – Sharon, Front of House Manager. Image taken from the centre of row A in Tier 1. Lighting/Set design for GLORY by Narda Mccarroll. 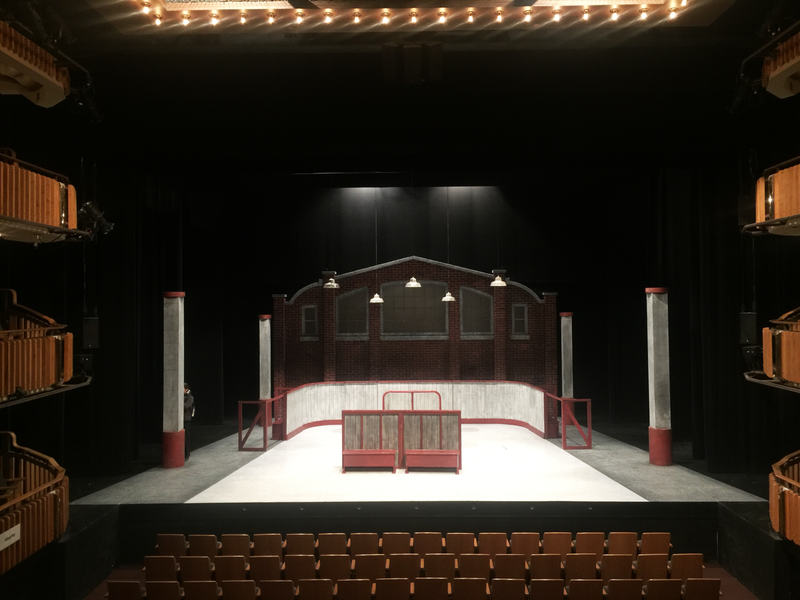 “I have seen the beautiful Martha Cohen Theatre in many different staging configurations, and my favourite viewing location for any of them is at either end of the horseshoe on Tier I. I love that not only can I see the actors quite close up and how the characters interact with each other, but I also get a chance to see how other audience members are reacting. Oh, and I can also see those of you in the orchestra who think you are sneakily looking at your cellphones during the show!” – Dianne, Producer. “My favourite seats in the theatre are in the middle third of the Orchestra, or at the very front of Mezzanine left or right. I like being close in so that I’m able to really see the nuances of the actors’ performances. That’s why I’m incredibly excited about the Thrust Stage coming back to the Martha Cohen Theatre for the 2018/19 season. This configuration puts you that much closer to the action – and those Mezz left/right seats sit you practically eye-to-eye with the performers. It’s a totally unique and wonderful theatre-going experience.” – Kara, Marketing and Communications Coordinator. THE THRUST CONFIGURATION BRINGS THE ACTION OUT INTO THE AUDITORIUM, WRAPPING THE AUDIENCE AROUND THREE SIDES OF THE STAGE. 2018/19 SHOWS IN THIS CONFIGURATION ARE THE VIRGIN TRIAL, ROSENCRANTZ & GUILDENSTERN ARE DEAD, AND ZORRO: FAMILY CODE. 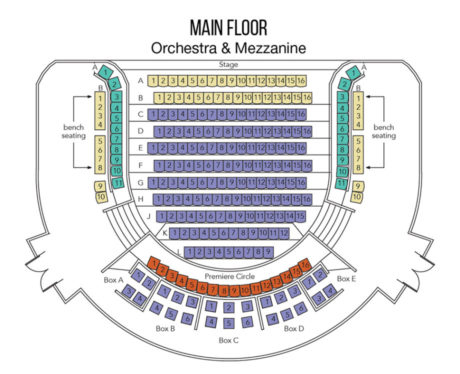 THE ORCHESTRA AND MEZZANINE SEATING ARE LOCATED ON THE MAIN FLOOR OF THE MARTHA COHEN THEATRE, LEVEL WITH THE STAGE, WITH THE MEZZANINE SEATING WRAPPING AROUND THE ORCHESTRA. 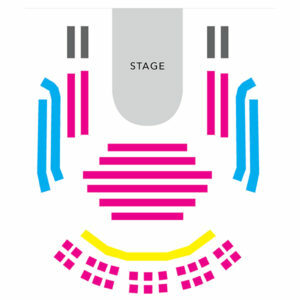 ROWS E TO G OF THE ORCHESTRA SEATING ARE AT THE CENTRE, INDICATED IN PURPLE. THE MARTHA COHEN THEATRE HAS TWO TIERS OF SEATING ABOVE THE ORCHESTRA AND MEZZANINE, ON THE SECOND AND THIRD FLOORS OF THE MARTHA COHEN THEATRE. 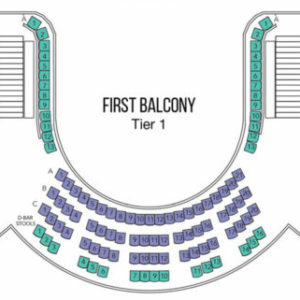 ROW A IS LOCATED THE FRONT ROW OF TIER 1, INDICATED IN PURPLE. ATP’s 2018/19 season features exciting changes, including a new seating configuration, 6-ticket Flex Passes, a Pay-What-You-Can Preview (first Tuesday) for all shows, and $15 Wednesday previews for all core season shows!